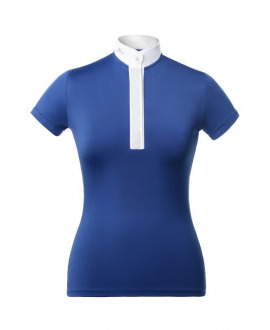 A competition shirt with a less official sporty look which, due to a detachable collar, can be used as a polo shirt for training. Made with the “second skin” technology guarantees comfort even during extremely hot days. It’s made of fabric which is elastic in all directions, breathable and moisture wicking. The slim fit cut ensures perfect fit to the body and wearing comfort. The shirt has got white hidden button placket with a sublimation printing in contrasting colour and a logo badge on a chest. 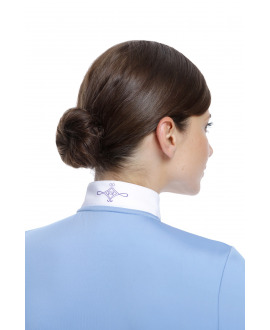 Furthermore, it’s embellished with elegant button from the Swarovski collection placed on the stand-up collar.